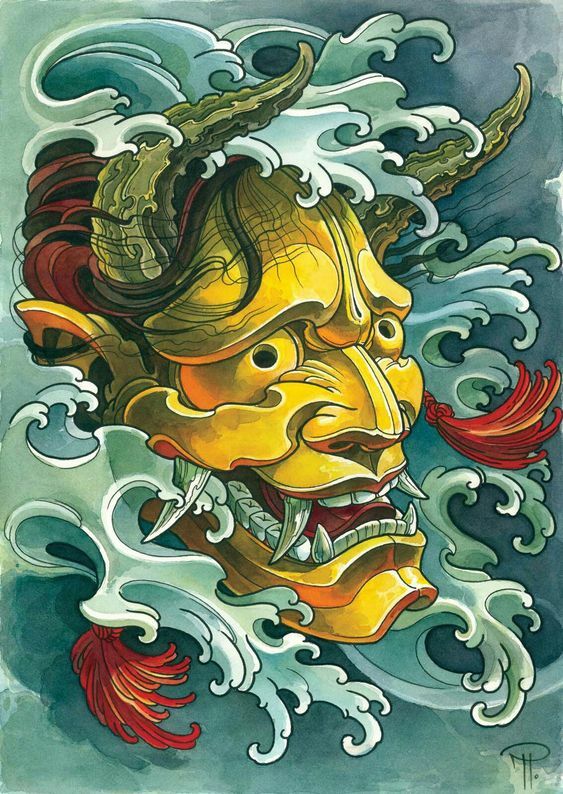 In Japan, tattoos and the yakuza often seem inseparable. Not every gangster has a tattoo and not everyone with a full bodysuit is a gangster, but when pop culture depicts the underworld, anti-heroes come fully inked. 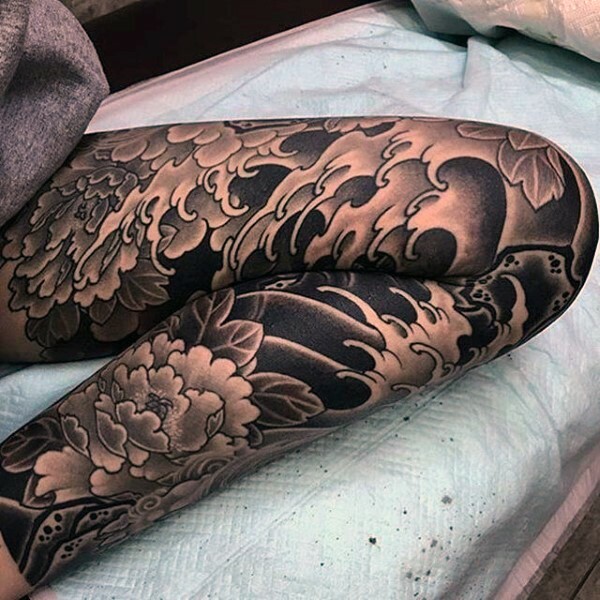 This is where the yakuza tattoo found a little crack on the tattoo community and since then dominated a niche market that is just amazed at its detail and intricacy. 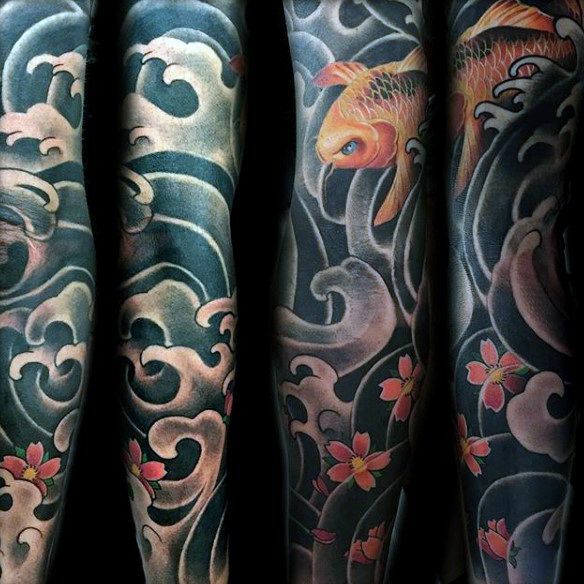 In this article, we will be talking about the various designs of the yakuza tattoo. We will also be sharing with you our magnificent gallery of designs that will surely captivate you. 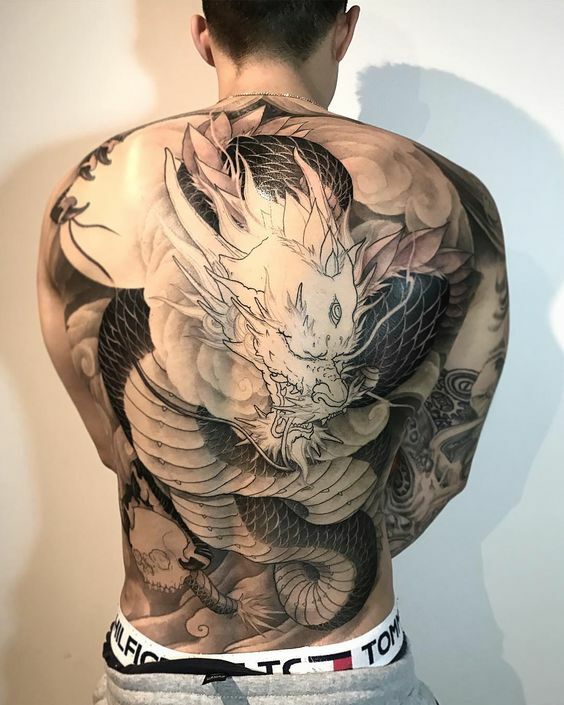 The yakuza tattoo is a branch of Japanese tattoo design but unlike other designs influenced by Japanese art and culture, the yakuza tattoo has this unique visual appeal even if compared to other Japanese-styled tattoo designs out there. Samurais refer to a special social class of people in old Japanese society who were also called the men of weaponry as they were supposed to provide protection to the high ranking families of the society in those times. These people fought battles against the wrong and it was a matter of honor for them. They carried special weapons like sabers, wakizashi (a kind of sword), and katana. 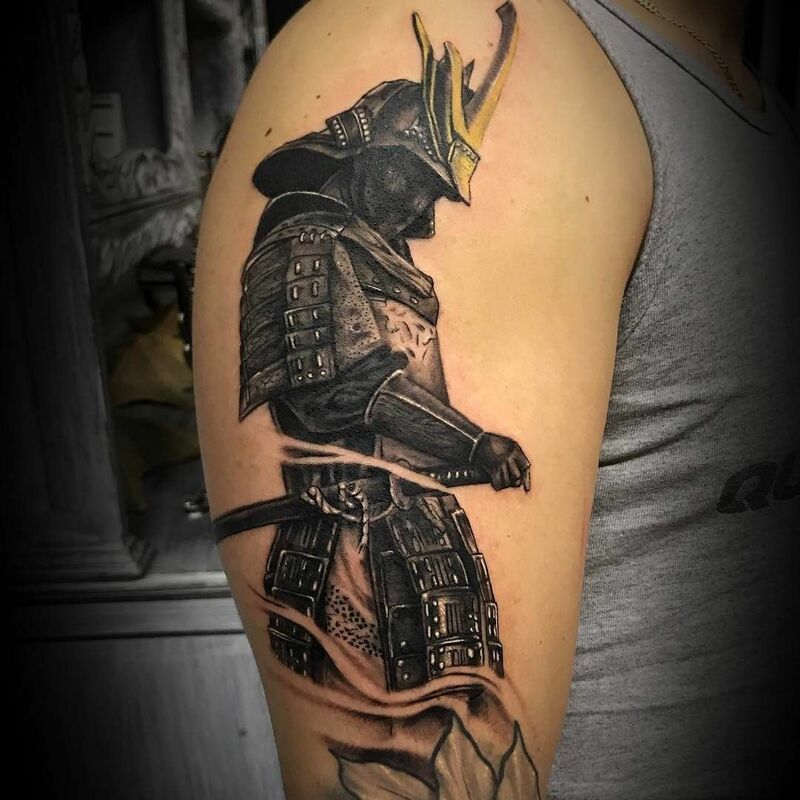 Samurais not only occupy an important position in Japanese culture, but they also are revered in the form of Japanese Samurai tattoo art, with special designs featuring the honor and courageousness of the Samurais. 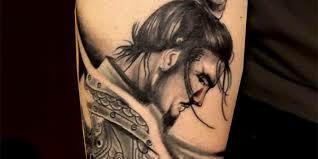 A large and extremely intricate samurai tattoo on the back. 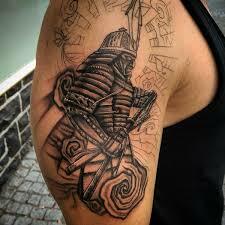 A heavy armored samurai tattoo on the upper sleeves. 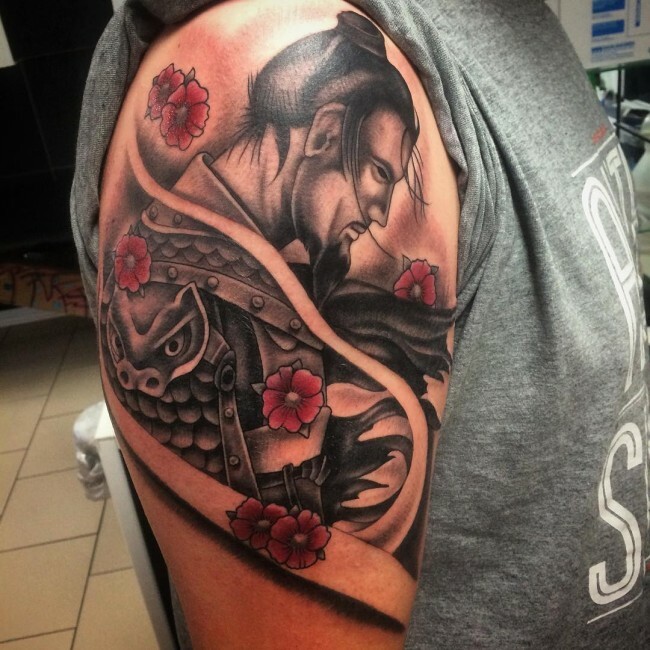 A fully kitted samurai tattoo on the upper sleeves. 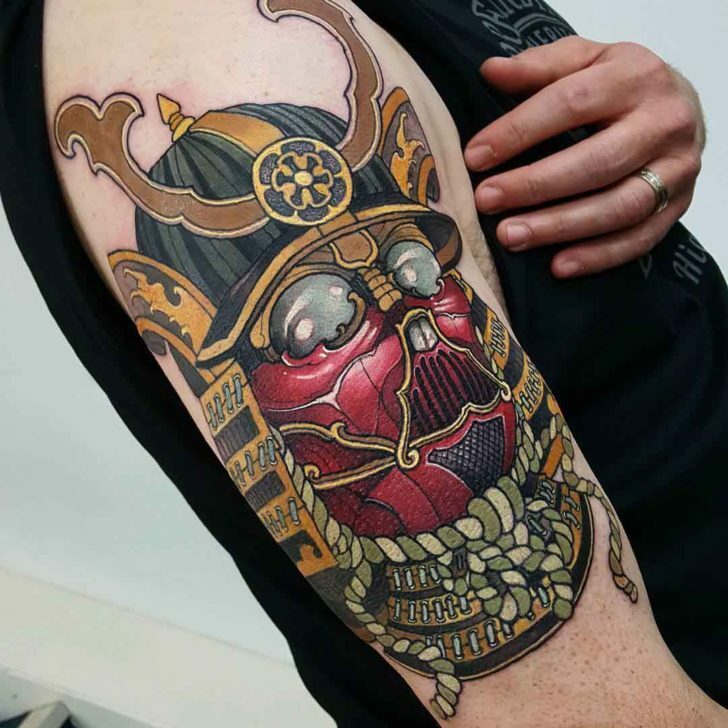 A very intricate neotraditional tattoo of a samurai helmet and mask. 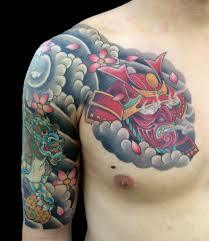 A large chest and upper sleeve tattoo of a samurai. 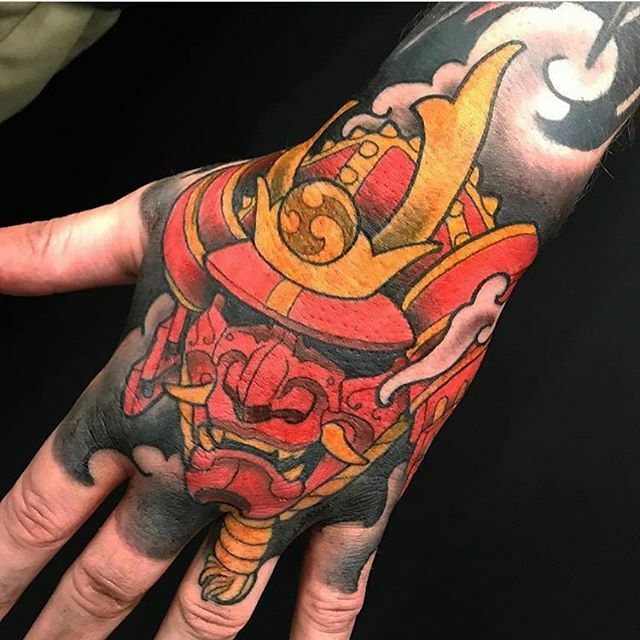 A neotraditional samurai helmet tattoo. 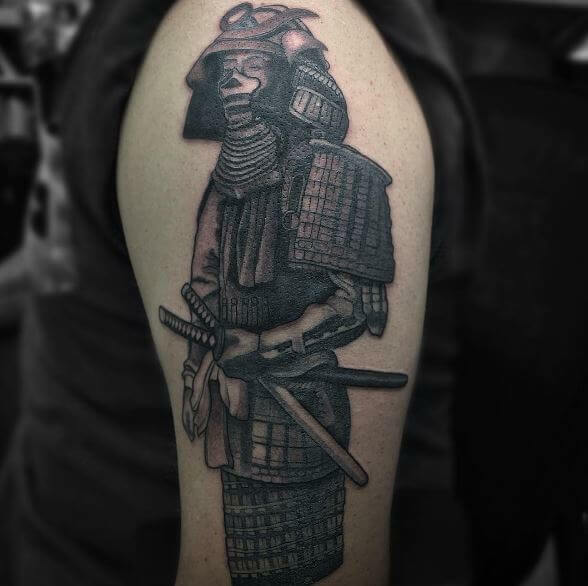 The samurai tattoo is actually just similar to the other kinds of tattoo designs that you can ink on your body since it is also very full of symbolism. Yes, this specific tattoo will not only augment your physical looks but also help you build a very intriguing and mysterious personality and aura. Which means, there will be more and more people who will become curious about you, especially to your very unique personality. One very significant thing that is being symbolized by the samurai is honor. What do you think is the reason then? Well, it is simply because being one of the samurais in ancient Japanese society is a great honor for those ancient Japanese people. They took honor so seriously that the samurais started the practice of Seppuku or Harakiri. 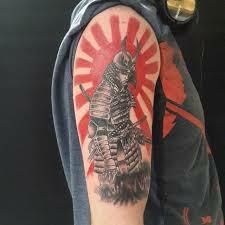 A samurai tattoo with the Imperial Sun as the background. 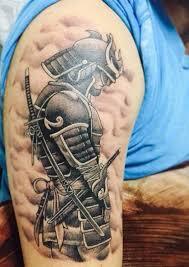 A forearm tattoo of a samurai at fall. Courage is another important thing that a samurai art is representing. There is no need for further explanations about it, for sure. The simple explanation regarding this is that those samurais in ancient Japan were considered to be very brave warriors. They never cared that their lives will be put into danger in doing their responsibility of protecting the nobility they were responsible to protect. 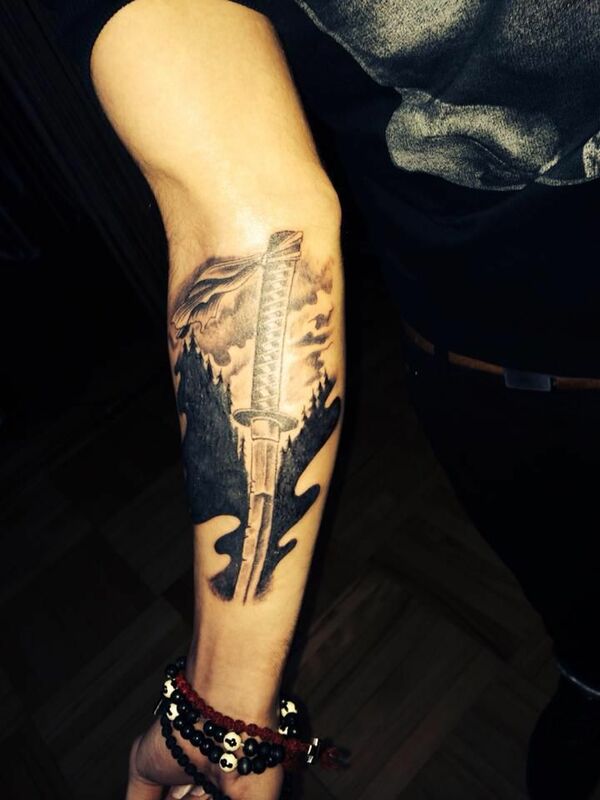 A handsome samurai tattoo on the arm. 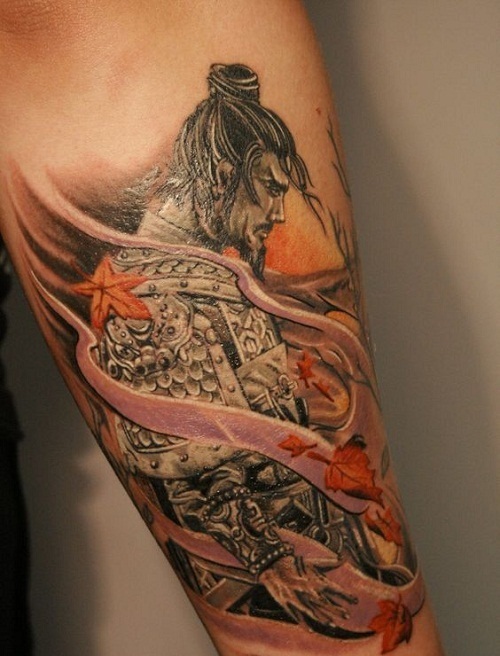 An intricate sleeves tattoo of a samurai. In the 15th century, the Japanese samurais of the day were already using firearms, pistols, and guns in protecting the ancient Japanese nobles. There are still occasions, however, where a silent weapon was still needed like assassinations and silent ambush which is why they still carry with them their traditional weapons such as their beautifully crafted Japanese katana. The swords also became synonymous with the yakuza since most high ranking officials of the yakuza wield a katana of some sort. 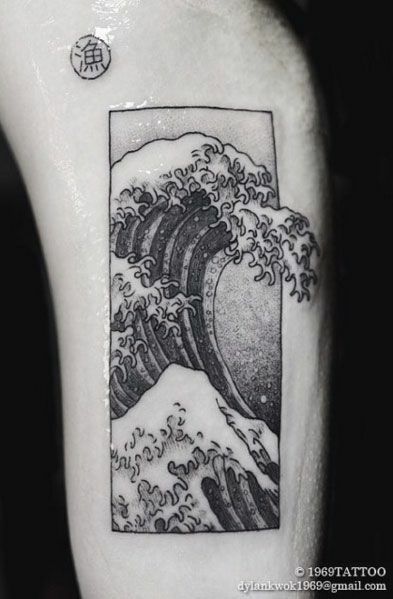 A forearm tattoo of a katana’s hilt with a landscape background. 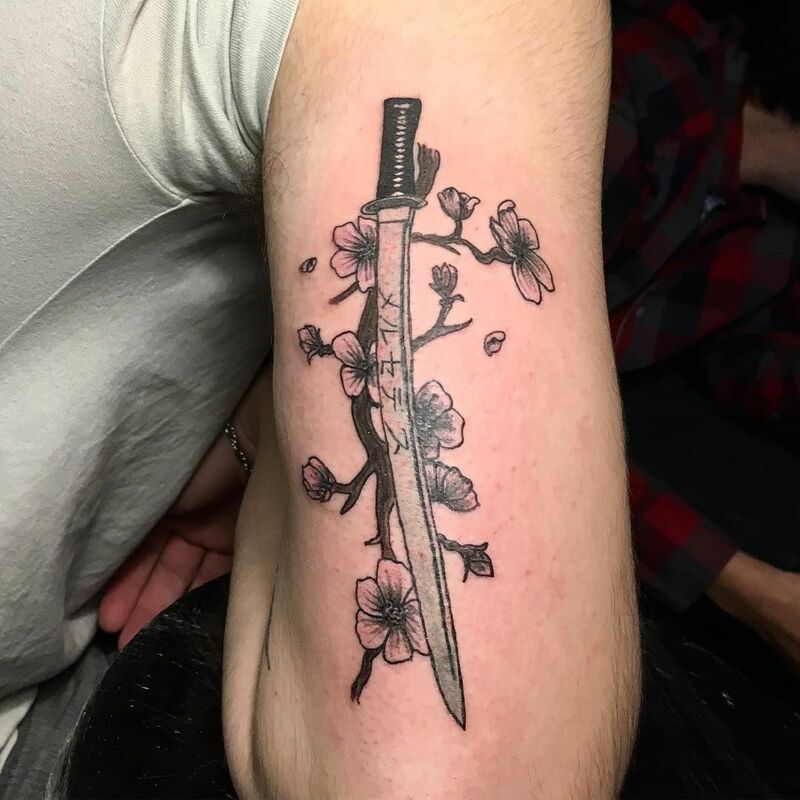 A medium sized tattoo of a wakizashi with a cherry blossom branch. 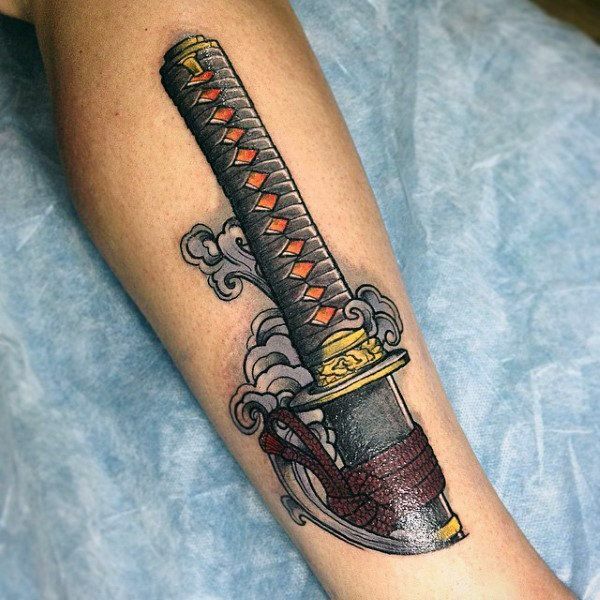 A neotraditional tattoo of a katana’s hilt. 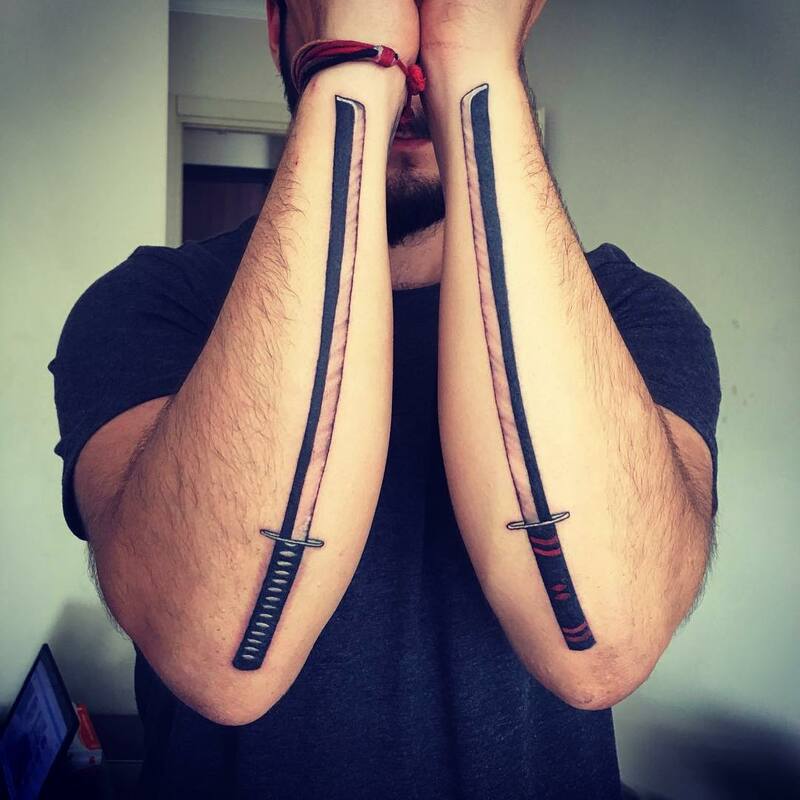 two katana tattoos on the forearms. If you will ask people aside from Japanese, they will tell you that this tattoo design symbolizes bloodlust and violence. Make an exception for the Yakuza and the Japanese people. 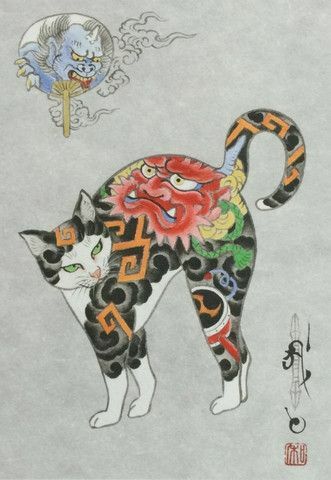 The Japanese and yakuza believe that this tattoo design symbolizes power, social stature, and order. 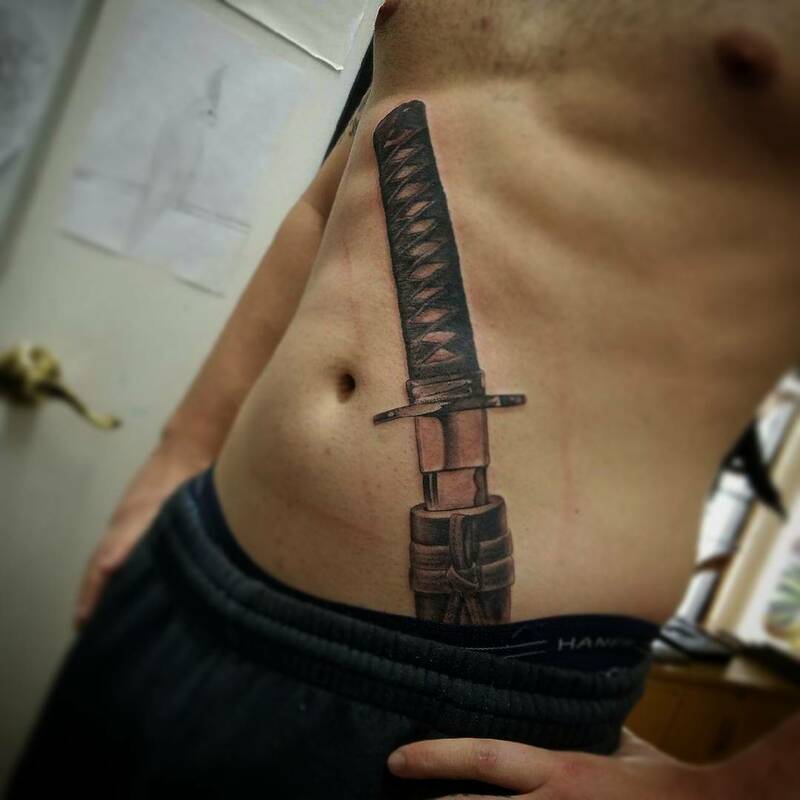 A large abdominal tattoo of a katana hilt. 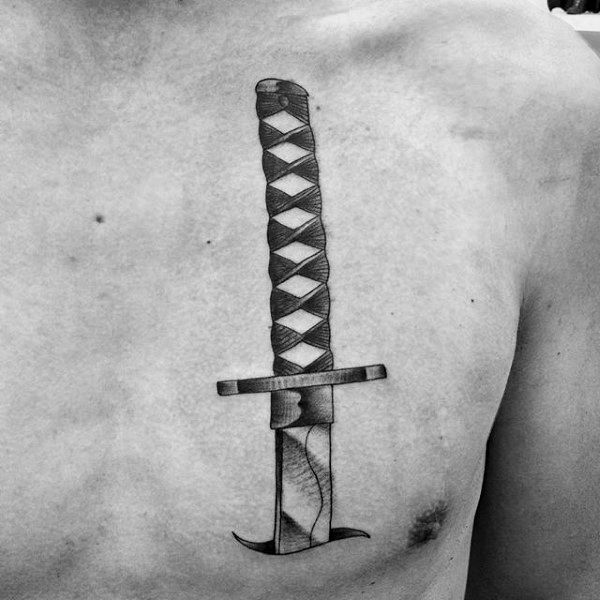 A chest tattoo of a katana hilt. 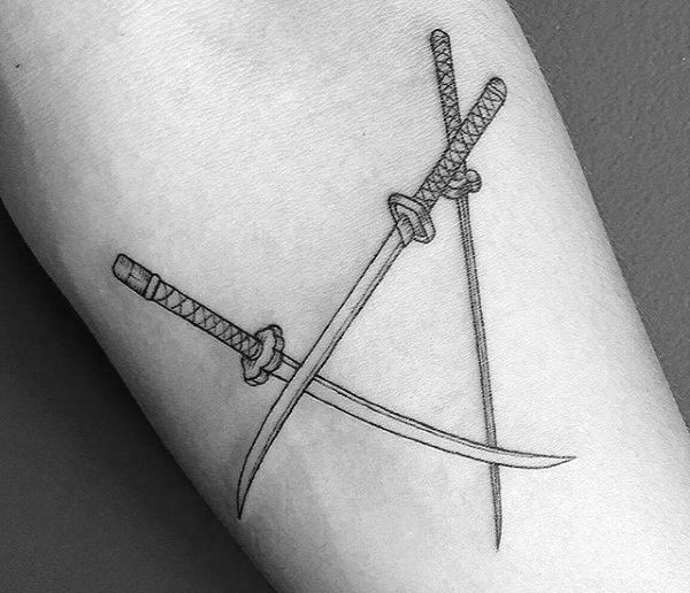 A tattoo of three katanas forming a triangle. 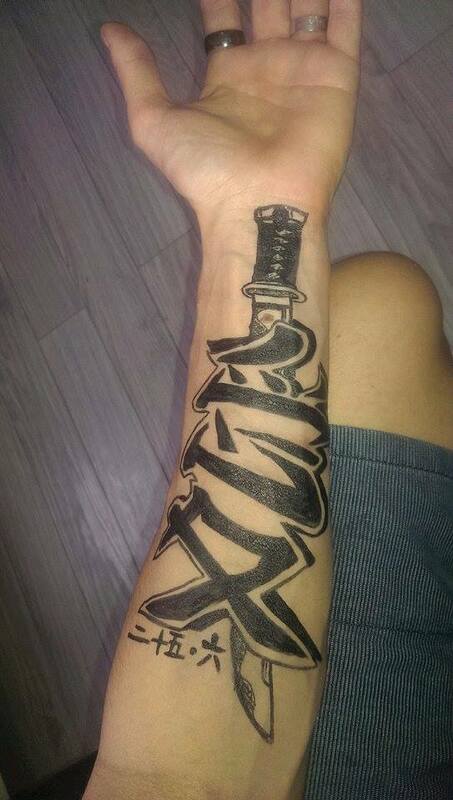 A wakizashi tattoo withNihongo characters. 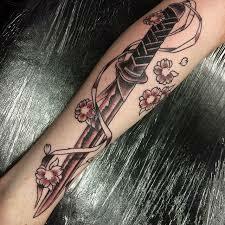 A wakizashi tattoo with cherry blossoms as additional detail. Today, some of the more traditional Japanese people are still aloof when it comes to tattoos. Tattoos have had a bad name in the Japanese tradition, as these were used to identify the Yakuza, which are known as the Japanese mafia. 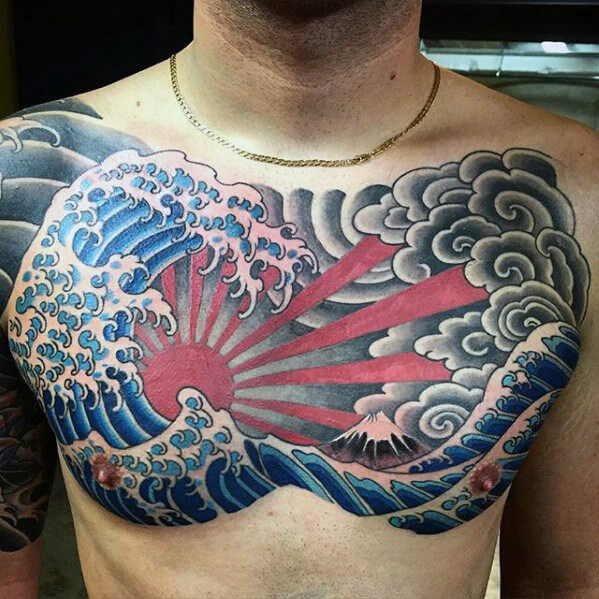 Some businesses tend to ban customers with tattoos from coming into their establishments, although more and more people in Japan are slowly becoming open-minded and accustomed to this type of art. 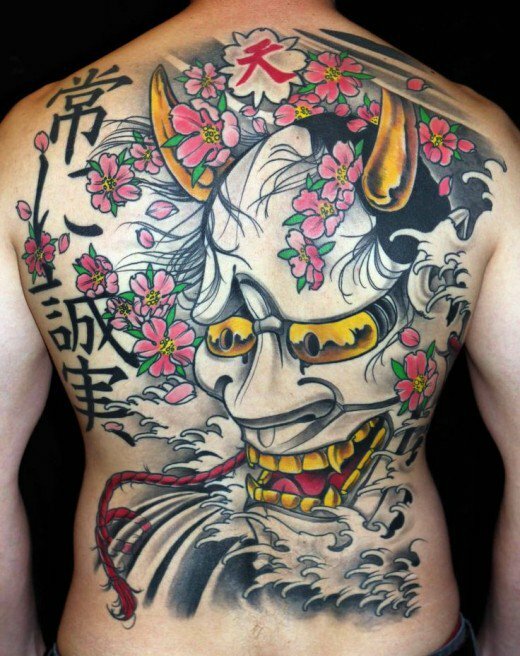 A very intricate and colourful oni mask tattoo on the back of a subject. An amazing black and grey oni mask tattoo on the lower arm. A black and grey back piece of the oni mask tattoo. An amazing and pretty usual tattoo design of the oni mask tattoo. 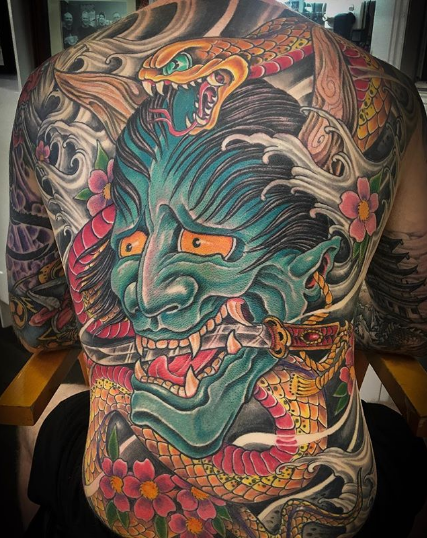 An amazingly done full back piece of the oni mask tattoo. The Oni is known to have an extreme amount of strength and are also well-known for being accomplished sorcerers. They are also well-known for being the guardians of hell and the ones that are assigned to torture and punish the souls that were sent to hell. Some people also believe that these creatures are cannibals. They are also believed to cause disasters, diseases, and other things that are unwanted and unpleasant. The Oni can also take on different forms and appearances to deceive and devour human beings. 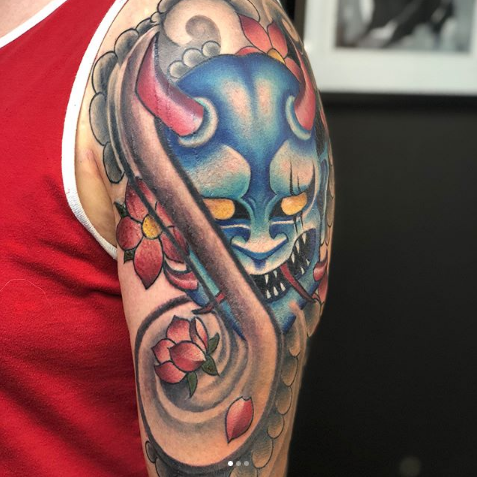 A beautifully done blue oni mask tattoo on the arm of a tattoo enthusiast. 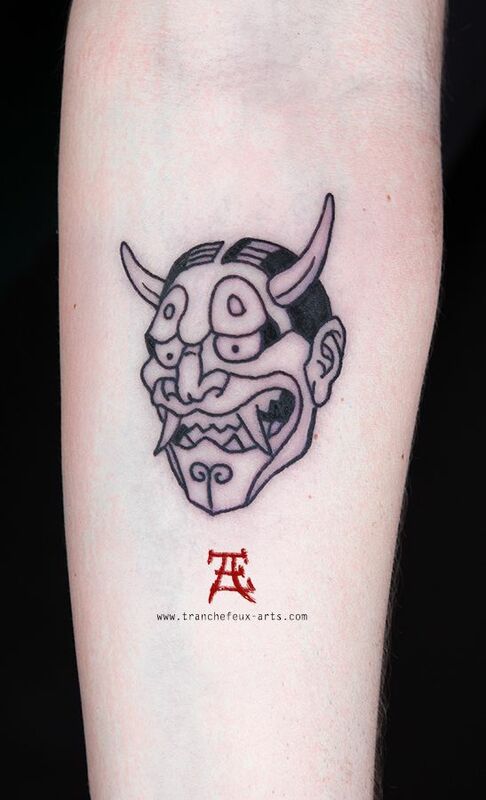 An oni mask tattoo done on the subject’s upper arm and shoulder. 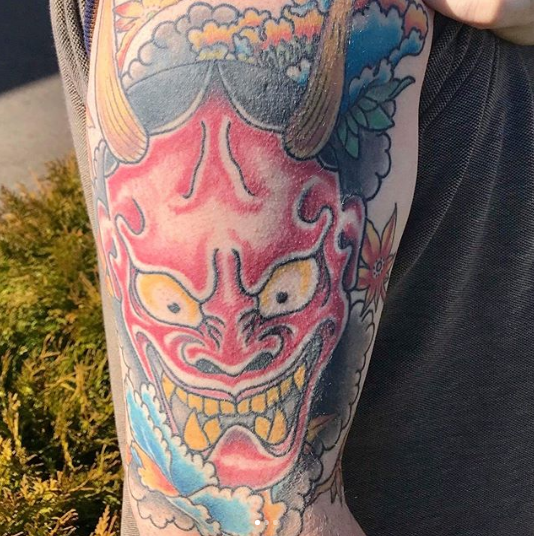 A colourful design of the oni mask tattooed on the client’s arm. 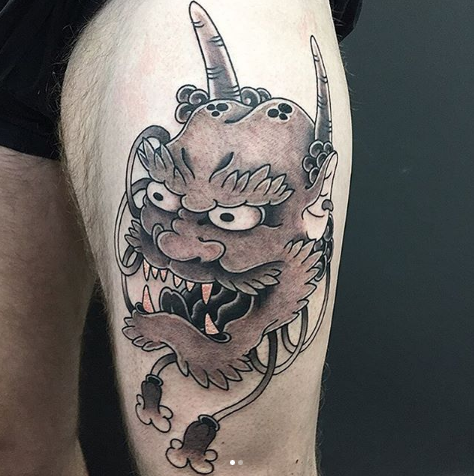 A beautiful black and grey oni mask tattoo on a male’s upper leg. Men, more specifically, Japanese men, dominates this part of the body art and tattoo market since a majority of yakuza members and affiliates are male. 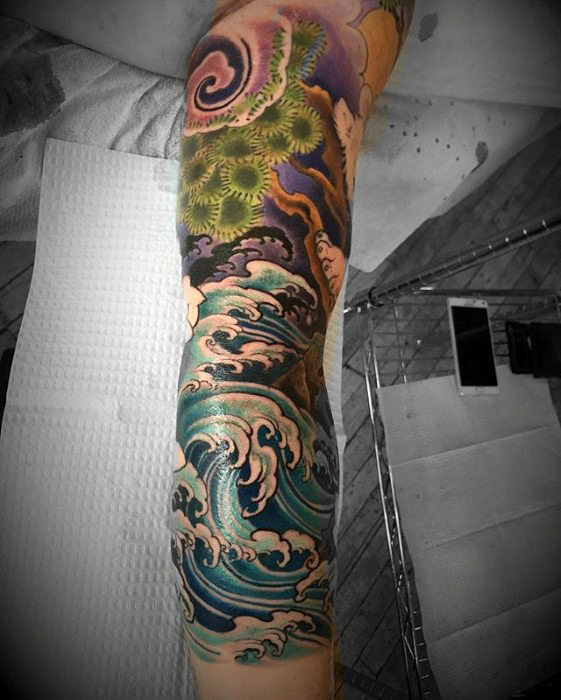 Because of this, a lot of yakuza tattoo designs are designed with men in mind. 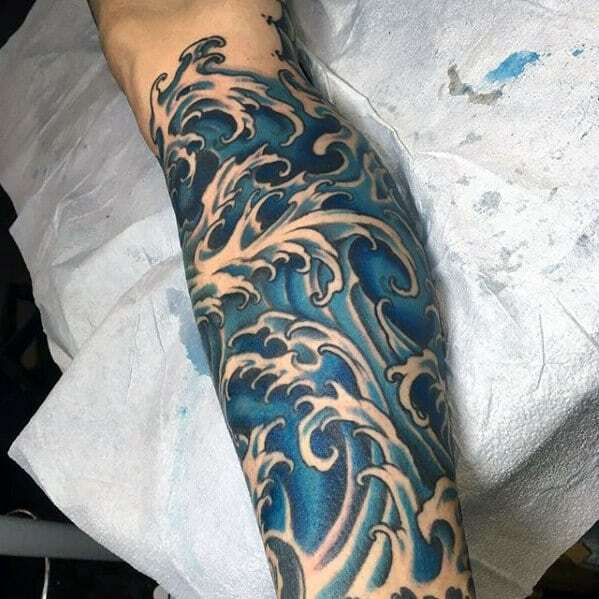 Often times, men who desires to have this will usually go with an “over the top” design that is just oozing and overflowing with visually striking tattoo elements. 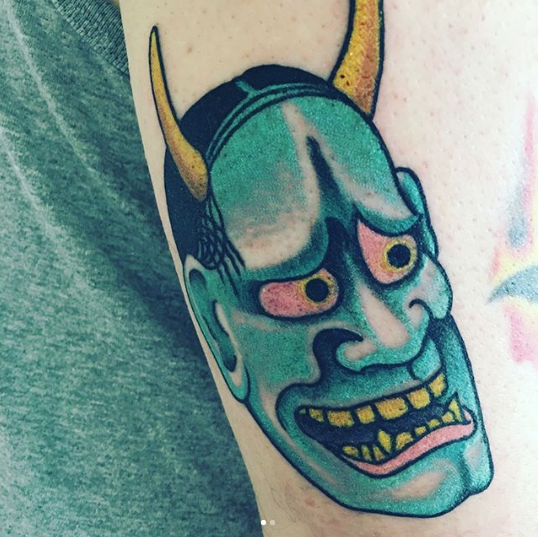 A simple but intricate back and grey oni mask tattoo on the arm. A unique and amazing oni mask tattoo drawn on a cat. 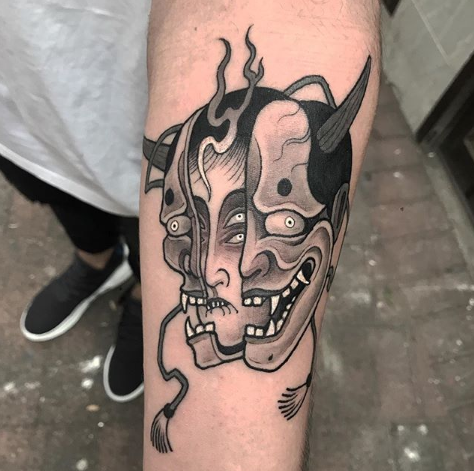 A very beautiful and detailed oni mask tattoo design for tattoo lovers. A huge oni mask tattoo done on the client’s whole back. 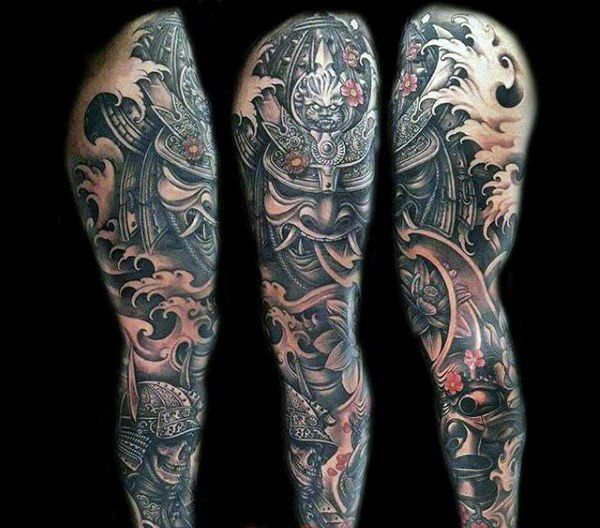 A large and highly detailed samurai tattoo on the sleeves. A full kitted samura tattoo on the sleeves. 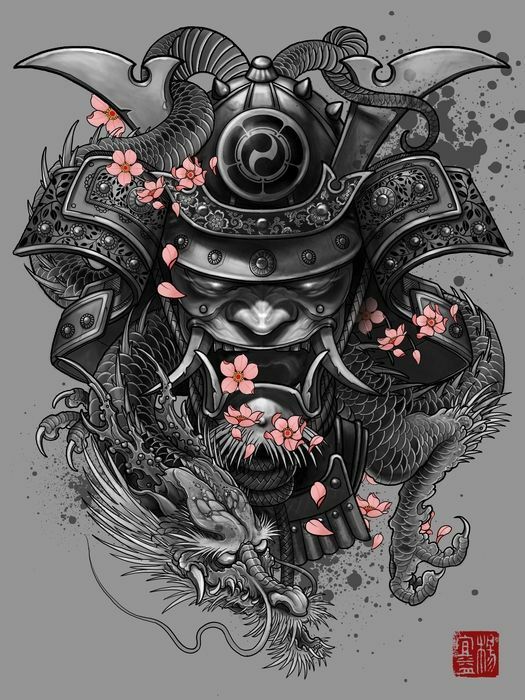 An intricately designed samurai tattoo on the sleeves with falling cherry blossoms. 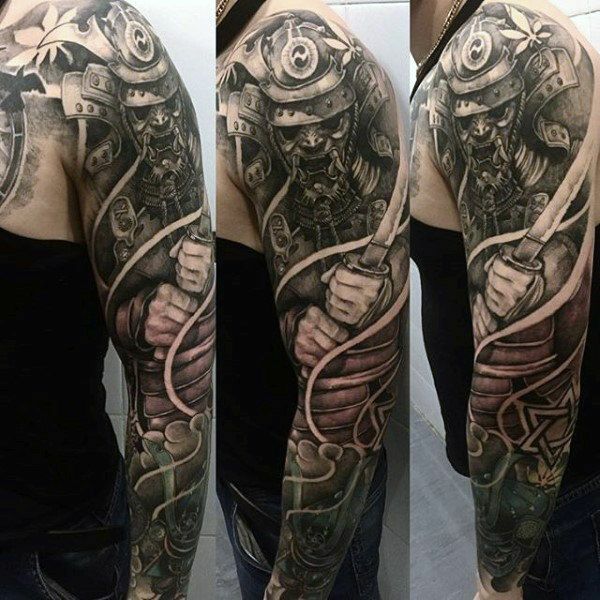 A full sleeve and highly detailed samurai tattoo. 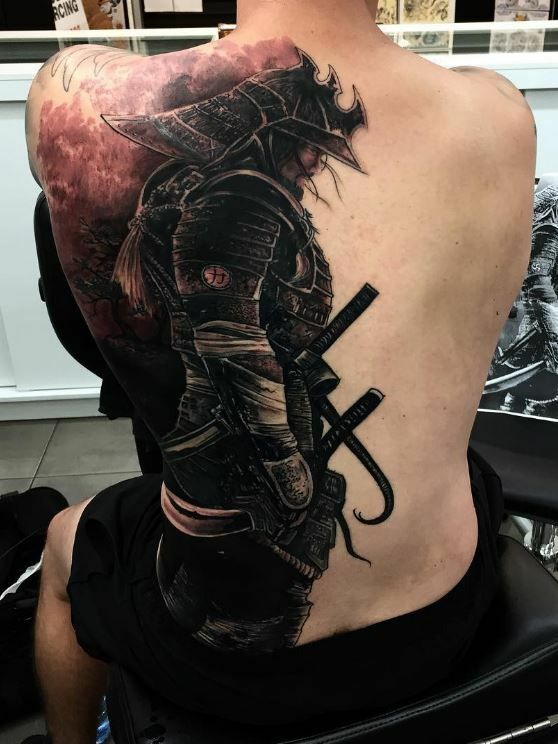 An epic looking and highly detailed samurai tattoo on the lower right back portion of the body. Although women are just a really small minority for this tattoo design, there are still designs available that are made for women. The women who usually get this tattoo are those who are married or related to the yakuza. women who desire to get this tattoo would also go for the visually striking designs just because it is the norm for this kind of tattoo design and it is just pure eye candy. 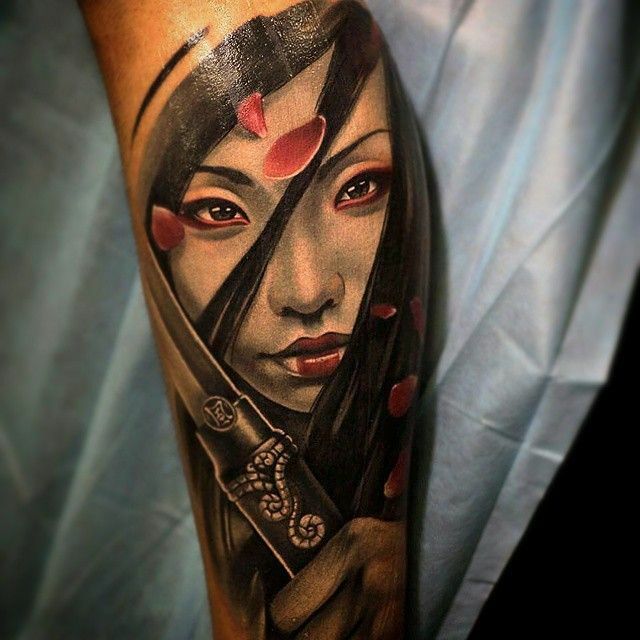 A wonderfully made girl samurai tattoo. 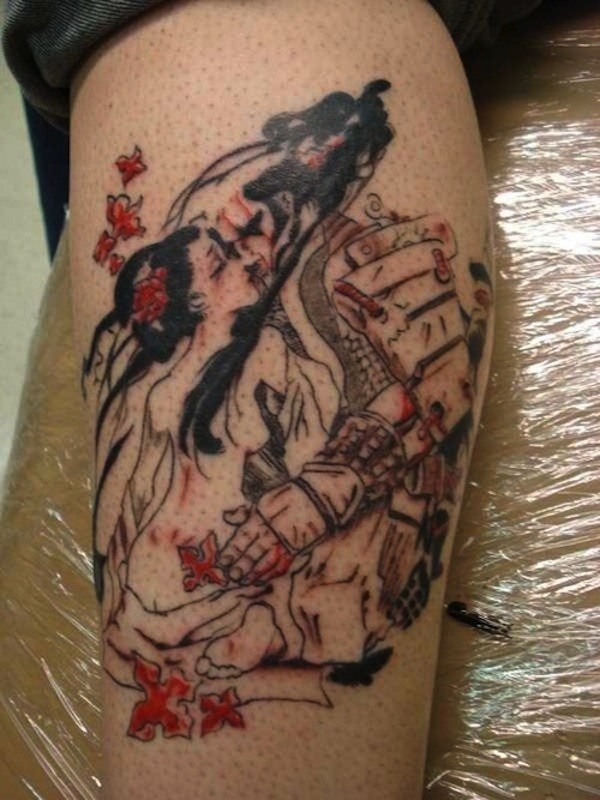 An intricate tattoo of a samurai and a geisha. 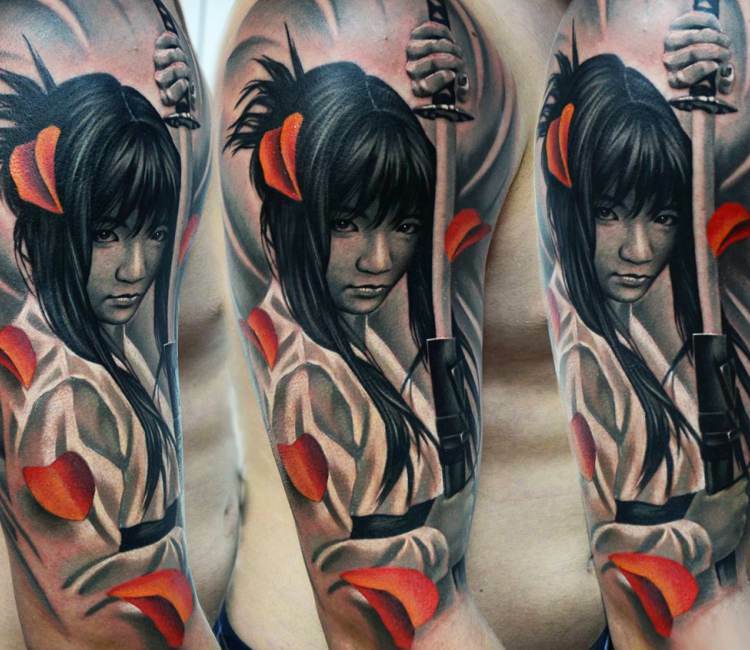 A highly detailed girl samurai tattoo. 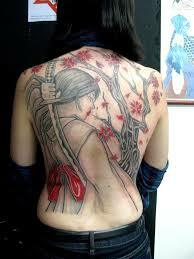 A large girl samurai tattoo on the back. 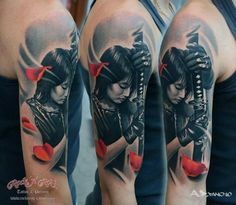 A noir girl woman samurai tattoo on the sleeve. The Yakuza tattoo design has a lot of variations. Hence, you’ll definitely find something that will suit your taste. What’s even better with this tattoo is that you can place it anywhere in the body and it will still look stunning. 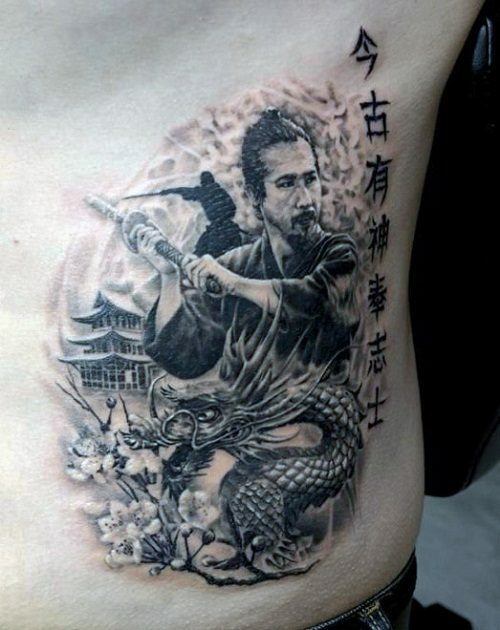 Have you found the right yakuza tattoo for you? Tell us in the comments below.